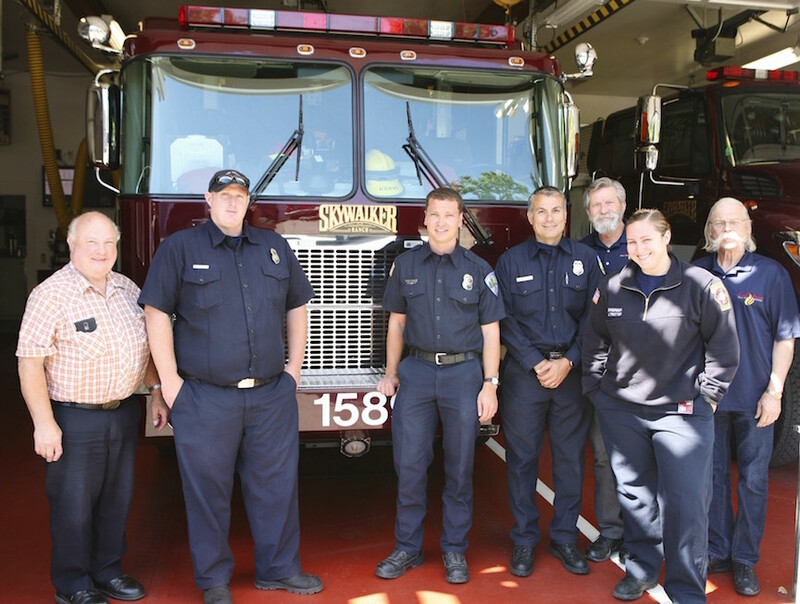 The Fire Prevention Officers section of the Marin County Fire Chiefs Association, formed in the 1960's. Full Story coming soon. The July 15, 2015 General Meeting of the Marin County Fire Prevention Officers section of the Marin County Fire Chiefs Association, held at Skywalker Ranch. (l-r) Warren Glass, Warren Security; Robert Bastianon, Ross Valley; Ryan Boykin, Southern Marin; Rubin Martin, Ross Valley); Hans Henneberque, H & S Associates; Jamie Trotter, Skywalker Ranch; Tim Madura, H & S Associates. 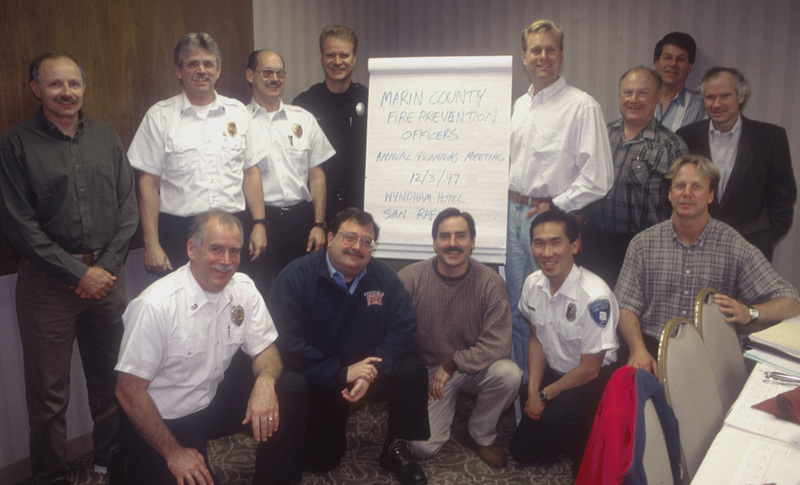 December 3, 1997 - One of the annual planning meetings for the Marin County Fire Prevention Officers section of MCFCA. Warren Glass, owner and principal of Warren Security, hosted the meeting location with breakfast and lunch for participants for many years. (l-r back row) ______, Tom Elliott, Novato; Steve Metcho, Novato; Ron Barney, Tiburon; Matt Cobb, Larkspur; Warren Glass, Warren Security; ________ ; _______. (l-r kneeling) ________; Jim Galli, Kentfield; Jeff Davidson, Mill Valley; Johnny Young, Sausalito; Joel White, Marinwood. Photo by Tom Forster. 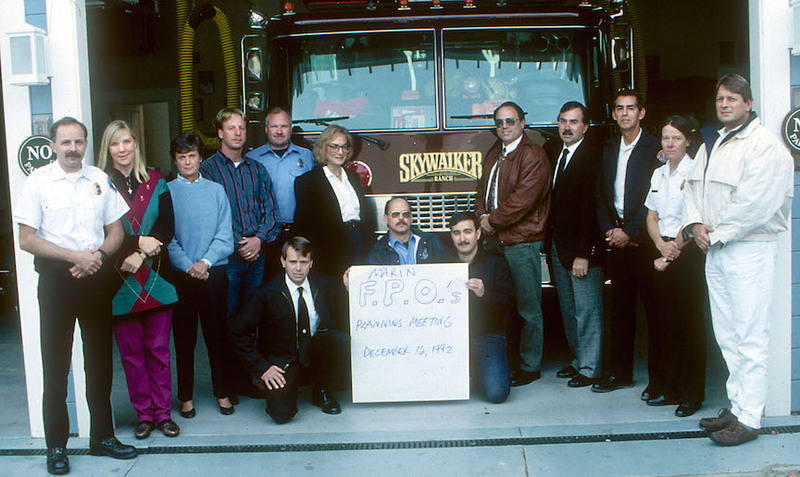 The annual planning meeting of the Marin County Fire Prevention Officers Section of the Marin County Fire Chiefs Association, held at Skywalker Ranch on December 3, 1992. (l-r standing) Kent Kirby, Sausalito; ______; ________; Joel White, Marinwood; _____; _____, Novato; John Lando, Kentfield; John Rentz, Novato, _______; Rosemary Bliss, Tiburon; Robert Fox, Corte Madera. (l-r kneeling) Brad Mark, San Rafael; Steve Metcho, Novato; Ken Dubuc, Skywalker Ranch. Photo by Tom Forster.